TC Capital was established to provide emerging, high-growth and mid-capitalization companies and private equity funds in Asia with the same quality investment banking services offered to large companies by the bulge bracket banks. We cover all of the major markets in Greater China, India and Southeast Asia through regional and local offices. 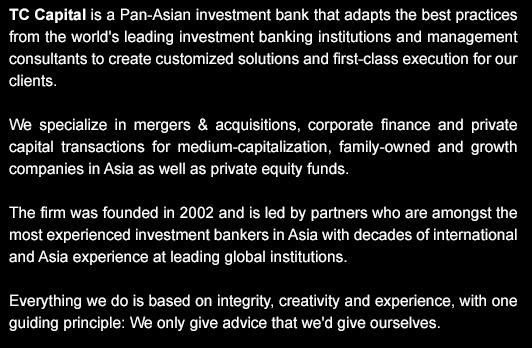 The founders, Dr. Tommy Tan and Mr. Ravi Chidambaram, and our team of partners and professionals are bankers with global experience specializing in Asia. Dr. Tan has taught economics at the University of Chicago and built several investment banking businesses, having formerly been Managing Director and Head of Investment Banking in Southeast Asia for Morgan Stanley and responsible for opening their Singapore investment banking office in 1992; Managing Director, Head of Investment Banking in Asia Pacific and Member of the Global Investment Banking Management Committee for Deutsche Bank, rebuilding their Asian investment banking practice in 1995; and Managing Director and Head of Corporate Finance in Asia Pacific, and Head of Investment Banking in Southeast Asia for Merrill Lynch in 1998. Mr. Chidambaram has been at Goldman Sachs, where he helped build entry for the firm in various key markets such as Germany and India, and worked on several landmark deals including the world's then largest privatization, that of Deutsche Telekom; Managing Director and Head of Telecoms, Technology and Media at Deutsche Bank, where he started and ran their first ever dedicated Asian telco group, and was a pioneer in developing project finance solutions for start-up mobile licensees; and Managing Director and Head of Technology investment banking group in Bear Stearns, where he built and ran the European tech group. Mr. Chidambaram has over two decades of investment banking experience divided equally between US, Europe and Asia. With our strong focus on client needs, TC Capital offers bespoke solutions followed through with first-class execution led by experienced partners. We offer our clients deep investment banking experience and strategic management consulting analysis, with extensive market knowledge and access to a broad network of corporate and investor relationships. We pride ourselves in giving honest advice, free from conficts, and recommending appropriate solutions to achieve our clients' objectives, rather than following short-term market fashion. By analyzing competitive and global trends in our clients' industries as well as their market position, we help clients develop their corporate objectives and then recommend a suitable corporate finance game plan. Timely execution of the game plan ensures the availability of sufficient capital at the lowest cost. An important development of Asian capital markets in recent years has been the emergence of large pools of capital controlled by private equity and hedge funds, with the specific purpose of investing in Asia. These funds are often a cost-effective and competitive alternative source of funds, as compared to the stock market and debt capital markets, particularly for mid and small enterprises. Highly structured solutions can be privately negotiated and created to meet the needs of the issuer and investor. TC Capital has a private capital markets practice which maintains a wide range of relationships with these investors and up-to-date understanding of their investment focus. We advise our corporate clients on the most appropriate way to access these funds and execute debt, equity and mezzanine transactions on a negotiated basis with these investors. We also work for private equity and hedge funds to identify investment opportunities, and to structure and execute transactions for them in the small to mid cap space. TC Capital approaches mergers and acquisitions by developing deep industry knowledge and strategic analyses of trends for our clients. We then formulate a mergers and acquisitions strategy by helping our clients identify suitable targets to add to their existing business or by helping them identify a good market window to dispose of their assets. Partners, each with decades of experience, actively lead transaction execution teams. We are focused on delivering the desired outcomes for our clients’ needs and are proud of the record valuations achieved when we advice on the sell-side and on the realisation of clients’ objectives post acquistitions when we advise on the buy-side. We are particularly proud of our track record in advising clients not to proceed with a transaction when our experience and analysis indicate that it would not be favourable. For our corporate clients who want to diversify their investor base and tap the public equity capital markets, our IPO advisory practice will lead the company through all stages of an IPO with objective and independent advice. The IPO process is long and exhaustive and our IPO experts run the process as part of the client team, which frees up management time to focus on the company’s core business activities. Apart from listing assessment and identifying an optimal exchange, TC Capital will engage, evaluate and coordinate the professional working parties for the IPO. Our clients’ needs are placed first, which means that we manage bank conflicts and working professionals, issues that often arise in an IPO syndicate. Further, our direct contact with buy-side institutional investors provide clients with a real time pulse of the market with conflict-free mindshare, allowing the team to work on the critical aspects of investment case positioning ahead of filing and marketing. Experienced bankers would appreciate the entrepreneurial culture with a positive work environment and transparent reward system. For entry level or mid-career bankers, TC Capital offers candidates a high achievement environment with a nurturing culture in the exciting world of high finance with broad geographical exposure throughout the Asia-Pacific Region. 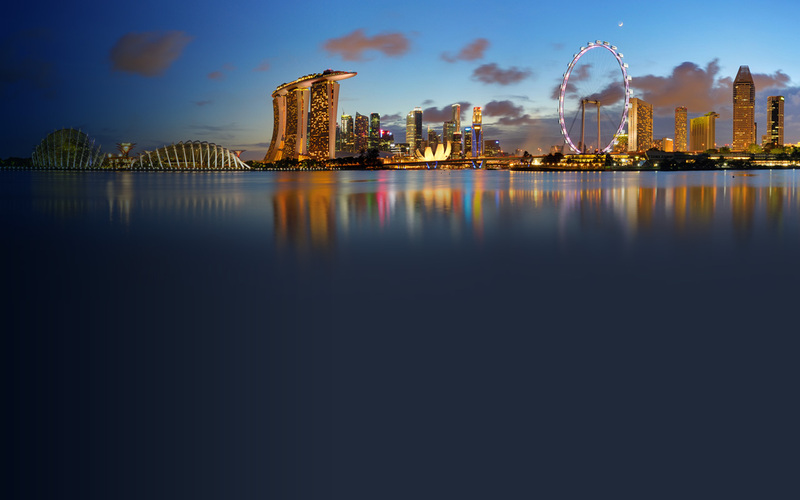 Opportunity to work with and learn from some of the leading investment bankers in Asia who have spent careers helping to create the current investment banking landscape in Asia with decades of path breaking transactions throughout the Asia Pacific Region. Comprehensive in-house training programs are augmented with close collaboration with partners from the start. Preferably, at least 1-2 years of related work experience and fluency in one or more Asian languages. Applicants should send a cover letter and resume to hr@tccapital.com. US$72mn monetization of First Philippine Holdings’ shares in Manila Electric Co.